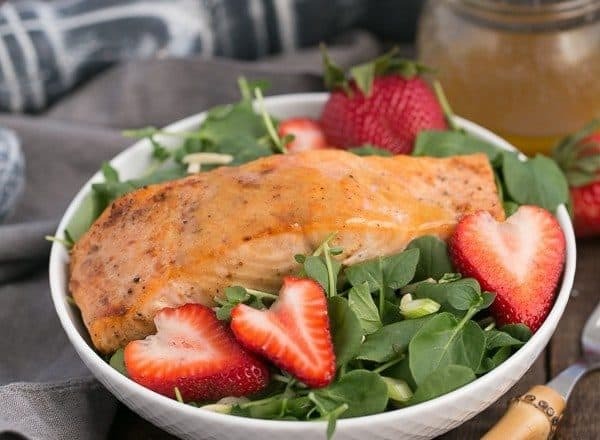 Salmon Watercress Salad with Strawberry Vinaigrette: fresh, tender, peppery watercress is tossed with an exquisite dressing and topped with roasted salmon. Make sure to scroll down to enter the giveaway! 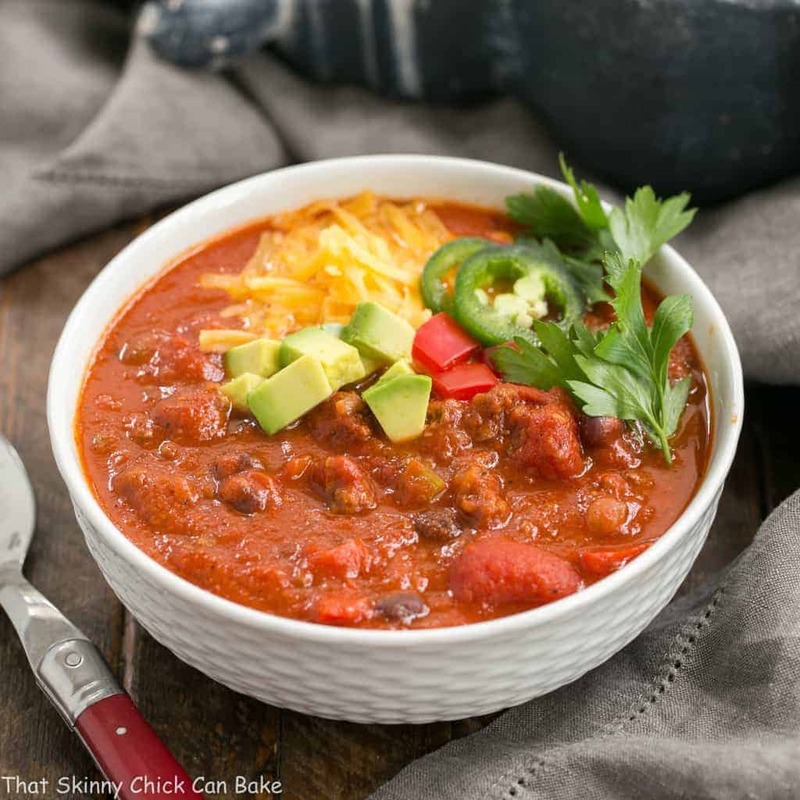 This recipe is sponsored by Honest Cooking. All opinions are my own. 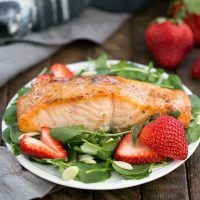 Before I created this scrumptious Salmon Watercress Salad with Strawberry Vinaigrette, watercress was off my radar unless it was in soup! Little did I know how hard I’d fall for a watercress salad! These tender greens had a peppery bite like arugula which made it the perfect foil for a sweet strawberry salad dressing. 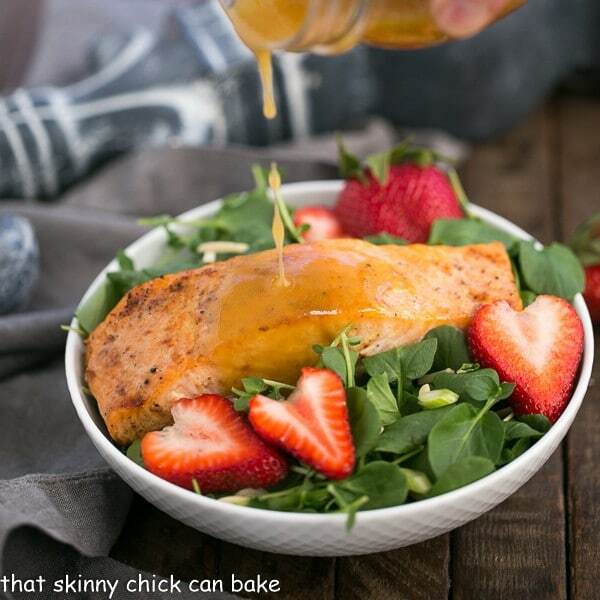 Topping with a piece of salmon glazed with this vinaigrette made this salad a fabulous meal! Did you know a spoonful of jam can add some delicious sweetness to a salad dressing? I’ve been making a raspberry vinaigrette for years, but thought a strawberry version was perfect for spring. With ripe fragrant strawberries filling the market, I wanted to add a few to this salad along with sliced green onions and toasted slivered almonds. Plus it doubled as a fabulous glaze for my seafood. If you have not been using watercress in your salad rotation, it’s time to start. Find more recipes and inspiration on the B & W Watercress Website, Instagram, Facebook, Twitter and Pinterest. 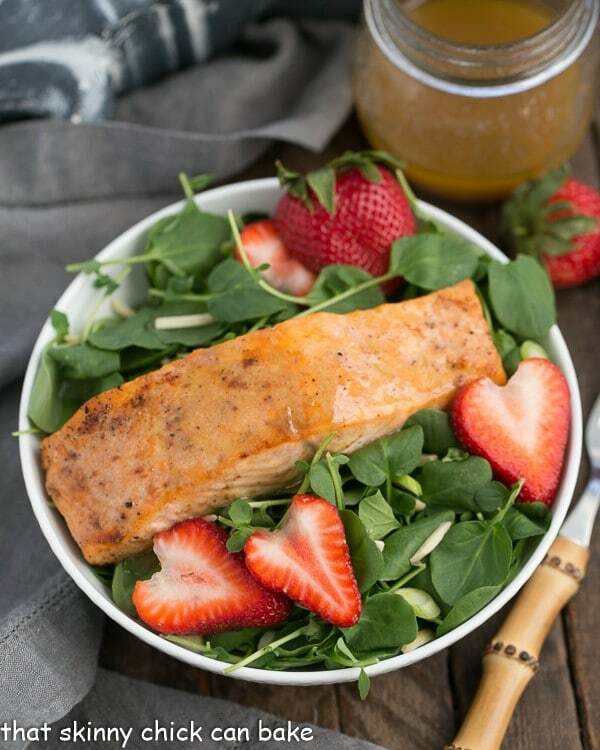 Salmon Watercress Salad with Strawberry Vinaigrette: fresh, tender, peppery watercress is tossed with an exquisite dressing and topped with roasted salmon. Whisk together jam, mustard and vinegar. Slowly drizzle in olive oil while whisking until mixture is emulsified. Add salt and pepper to taste. Set aside. Preheat oven to 400 degrees. Place salmon fillets on a sheet pan. Season salmon with salt and pepper. Roast for about 12 minutes, then re-whisk dressing and use about 2 tablespoons to brush over salmon. Turn on broiler and broil the salmon about 4-6 inches away from the heating element until tops are slightly browned, about 2 minutes. Watch carefully so salmon does not burn. Let cool (may refrigerate if you’d like cold salmon on your salad). 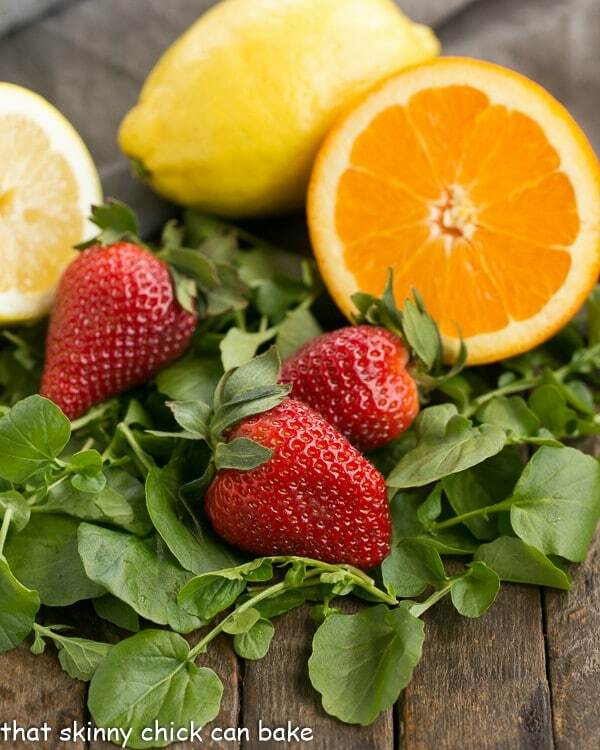 When ready to serve, toss together watercress, strawberries, green onions and almonds with enough salad dressing to lightly coat the watercress. Divide between 4 salad bowls or plates. Top with cold or room temperature salmon. Drizzle with any leftover salad dressing, if desired. How delicious! I had salmon yesterday too, but I want some now too! This sounds great and I particularly like the sound of the strawberry vinaigrette. I absolutely LOVE watercress and don’t use it enough! This salad looks amazing! 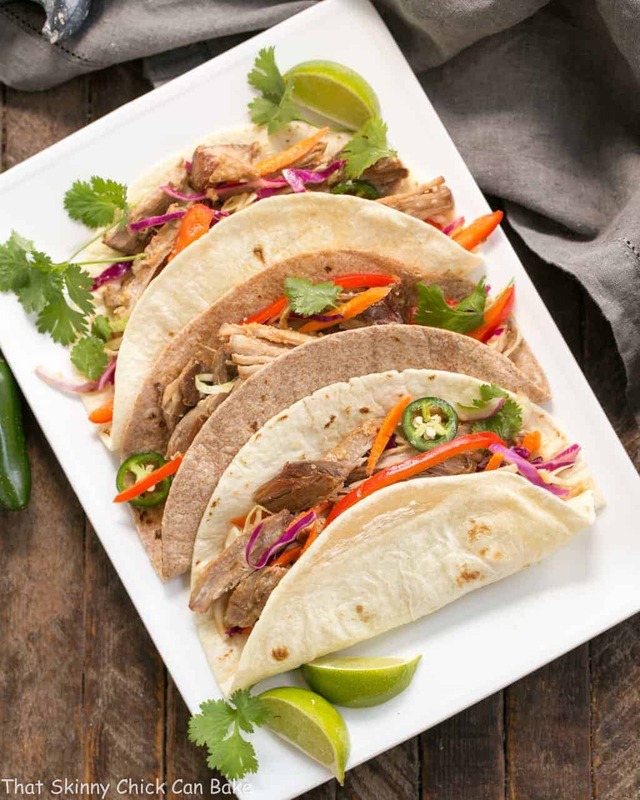 So light, healthy and flavorful. 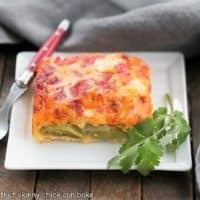 The perfect summer dinner! Just stunning, Liz, as far as I’m concerned, you are the Strawberry Queen! This looks like my ideal lunch or dinner. I really am missing salmon right now. So expensive normally! This looks fabulous and so inviting! 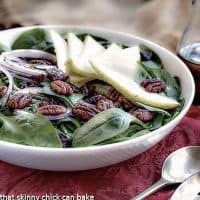 This salad looks fantastic! So flavorful and healthy. I do enjoy watercress when I can find it. 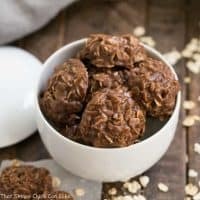 Such a beautiful recipe too! Love the healthy ingredients! YUM! Dear Lizzy, What a delicious meal. 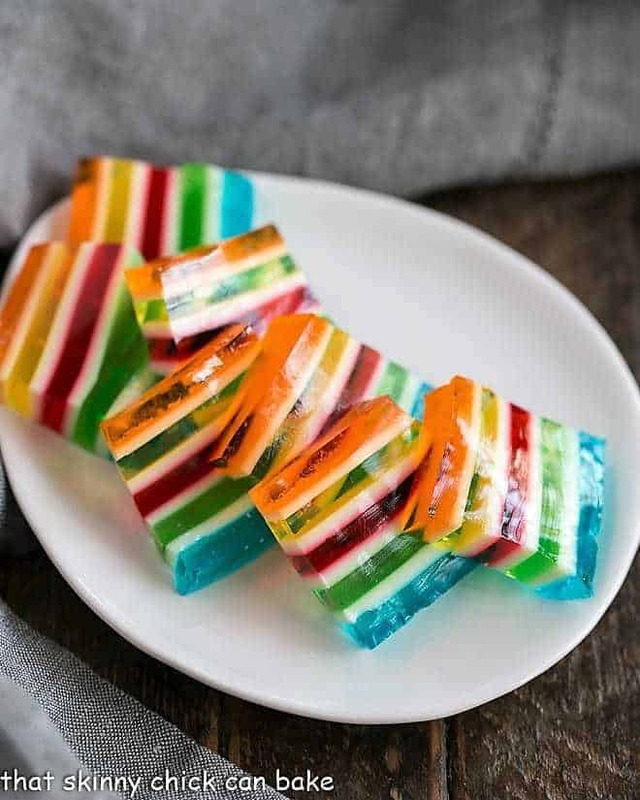 It is healthy, colorful and delicious. I have only just started cooking with salmon, and this combo looks delicious! What a delicious looking and healthy meal!!! My mouth is watering for that salmon and vinaigrette! Your pictures are amazing. I love the strawberry vinaigrette with salmon and watercress salad. Sounds perfect for dinner. I hope you have a lovely Mother’s Day Liz! This is my kind of salad!! I love when I’m out and can order watercress, need to use it at home more. Gorgeous! I need to try this. Sounds delicious! Yum! 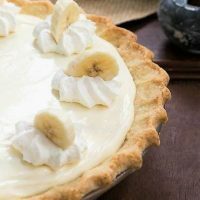 Just pinned this recipe for later. This vinaigrette sounds delicious and I’m off to check out the recipe. You reminded me how much I love watercress, and how long it’s been since I’ve had it. We make an awesome grilled potato salad served on a bed of watercress. Gah! It’s SO GOOD!